Dual-carriageway bypass of Ballykelly village, on the main A2 Coleraine to Londonderry route. The A2 road runs from Coleraine to Limavady, then to Londonderry via Ballykelly. It is a small village, although it is home to a large army base. The level of traffic is high (14,965 vehicles per day at nearby Greysteel in 2007) and causes disruption to the local residents and delays to drivers. In the 1960s the M23 was planned to run this way, but this was scrapped and the plan reduced to a trunk road bypassing the village in the 1970s. However, this plan was also abandoned. The most recent incarnation of the plan will see a 6km bypass constructed around the south side of the town. Initially planned to be built to 2+1 standard, the most recent information is that it is now planned to be a full dual-carriageway. Following the announcement that the road could be built either to the north or south of Ballykelly, in May 2008, the Regional Development Minister announced in February 2009 that the southern corridor had been chosen and the actual route was announced in March 2010 (see below). There had been suggestions that a northern route could use some of the military land at Shackleton Barracks to reduce costs, but in practice the amount of such land in the northern corridor is actually quite small (no more than 15% of the route). The design released in March 2010 shows roundabouts at the start and end points and a compact grade separated junction at Loughemore Road, which the Bypass will cross on a bridge. Tully Road and Glenhead Road will both be preserved via bridges, but will not join the Bypass. The draft Northern Area Plan 2016, which was published in 2005, says "the proposed Ballykelly by-pass will, when constructed, provide a 7 kilometre single carriageway road taking the bulk of through traffic away from the village, thereby considerably improving environmental conditions". However it was not included in the Regional Strategic Transport Network Transport Plan 2015 (published in 2004) which shapes the road building policy for the province up to 2015, due to lack of money. This meant that it would not be constructed before 2015. However on 31 July 2006, the Department for Regional Development published a consultation document "Expanding the Strategic Road Improvement Programme" which envisaged an additional £400m over and above the £1bn already earmarked for this period. The go-ahead was given two years later in April 2008 with construction timetabled for the period 2013-2018. The government also tentatively suggested that a Greysteel Bypass (joining the west of the Ballykelly Bypass) may be on the cards after 2015. 18 Aug 2010: A Roads Service briefing to Derry City Council on 6th July fairly bluntly summarises the status of this scheme: "Minister put on hold until 2020". In other words, don't hold your breath that this scheme will be built in the next decade. 21 Jun 2010: According to a DRD board meeting (DRD is the government department that oversees Roads Service) held at the end of March, the cost estimate for this scheme has risen to the range £35-40m (up from the £30m estimated in 2005). The minutes also state that they have decided "due to the current uncertainties relating to future capital allocations, to defer Gateway 1 approval at this time". This basically translates as "because we have no idea what money we're going to have in the next few years, we aren't going to do any more planning work on this project for the time being". 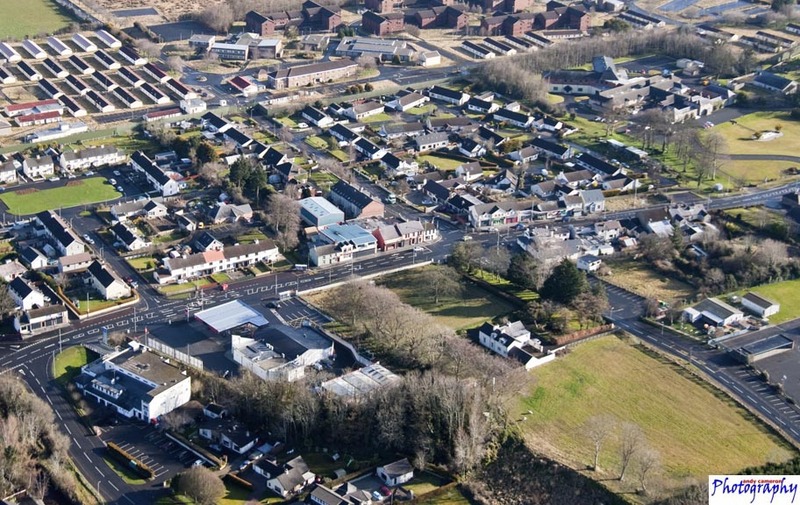 Photographer Andy Cameron has kindly provided an aerial photo of Ballykelly which I have included above. Many thanks. 7 Jun 2010: In a press release issued three weeks ago, the Minister confirmed that construction of this scheme is due to begin in 2017/18. However, this is so far in the future that it cannot be considered to be anything but the vaguest of start dates. The current economic climate makes even imminent schemes uncertain. As has been stated, the preferred route was only anounced this year in order to inform the disposal of the lands of the disused Ballykelly army base. 2 May 2010: The Preferred Route was announced on 26th March. The proposed route is to a high standard with gentle, sweeping curves and access limited to roundabouts at the start and end and a compact grade separated junction at Loughemore Road. To achieve this geometry, the proposed route boldly cuts a 1km swathe through Ballykelly Forest, an embankment across 150 metres of a local landscape policy area and about 300 metres of a Site of Local Nature Conservation Importance. Routes which avoided Ballykelly Forest were rejected because they were longer, cost more and severed more land. Longer routes on the eastern side were rejected because of potential for disturbance/contamination from a landfill site and adverse impact on wildlife. A shorter route to the east which would have avoided the SLNCI was rejected due because it offered less in terms of cost-benefit and benefit to traffic. Although construction is still many years away, it seems certain that the route will be contoversial, especially its impact on the Forest. 25 March 2010: According to the Roads Service web site, there is due to be a public exhbition about this scheme tomorrow, 26 March. However, Roads Service don't seem to feel the need to tell us WHERE this exhbition is going to take place, or indeed at what TIME it will happen. Perhaps local people have been told about it, but the web site lacks this information so those outside the vicinity obviously cannot attend. It is likely that the exhibition will release information about the preferred route, which is due around now. The Minister may also release a press release tomorrow. 21 August 2009: It has been pointed out at that the leaflet released by the DRD last April indicated that the design of the scheme has now been upgraded from 2+1 standard to dual-carriageway standard. This is in keeping with Roads Service's general aspiration to upgrade all the major road corridors in Northern Ireland to dual-carriageway standard. Nevertheless, it still seems unlikely that this scheme will get underway for almost ten years (at the earliest). 7 July 2009: At a meeting with Limavady Borough Council about three weeks ago, Roads Service said that the preferred route for the Ballykelly Bypass is due to be published "by early 2010". 12 April 2009: Roads Service held a public consultation on the scheme on 7 and 8 April, presumably seeking comments on February's preferred route. Unfortunately this information was only published on the DRD web site during the first day of the consultation, so there was no time to publicise it here. 12 Feb 2009: Yesterday, the Regional Development Minister Conor Murphy announced that the southern corridor had been chosen for the road. According to the web site "Roads Service will now progress the development of a preferred route within the southern corridor. It is intended to present route options at a further public exhibition in spring 2009." Note, however, that construction of this road is still seven or eight years away at the earliest, and possibly later. 22 Sep 2008: According to the Regional Development Minister, the process to develop a preferred route corridor is in progress and that the process should be completed "by the end of the year". While the project is currently timetabled for the period 2013-2018, the minister has cautioned that it is likely to be "towards the end" of this period, ie closer to the 2018 date. 23 May 2008: The public consultation two weeks ago revealed the broad area within which the route will eventually lie. The Google Earth map shown above is based on the map that was on display at th event. No date for an announcement of the final route has been set, and construction is still up to ten years away. 5 May 2008: The document "Investment Delivery Plan for Roads" released in April 2008 has granted approval to progress this plan (which hitherto had just been a proposal) through the legal and design stages. Construction is due in the period 2013 to 2018 (ie within 5 to 10 years). Public consultation events will be held in the Drummond Hotel in Ballykelly between 3pm and 9pm on Wed 7 May 2008, and between 10am and 9pm on Thu 8 May 2008. All those with an interest in the scheme should be encouraged to attend as this is one of the few opportunities to have your opinions heard. 3 Mar 2008: According to one of these written answers, a commission to develop a "Preferred Option Scheme Assessment" was appointed in December 2007. This basically comes up with the various options that are available. This will lead to a public information day in April or May 2008 when the public will be able to give their views.